Ah the New Year holds such promise. Have I mentioned recently how much I love blogs? Shortly after the new years started I received a correspondence inquiring about a William Acton image. I responded and soon found why this gentleman had an interest in Acton. When perusing his family archive, he stumbled upon a cashe of Acton drawings. Over 50 works of Acton's that have not been seen in years! Now he is on a mission to identify all of Acton's drawings and painting and possibly hold a show. A show means a monograph! Finally!!! 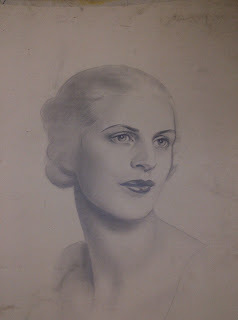 Until then, he was kind enough to send me the above drawing of Mary Warburg. Mary Warburg was married to Edward Warburg, philanthropist and founder of the New York City Ballet. now thats a find! 50!